Make your kitchen or bathroom look new at a portion of the cost of replacing with ALL SURFACE REFINISHING. 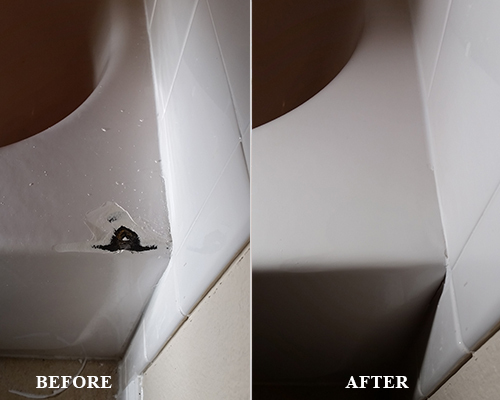 We are a tub and tile refinishing company in Richardson, Texas with over twenty years of experience and can make surface areas look new again. 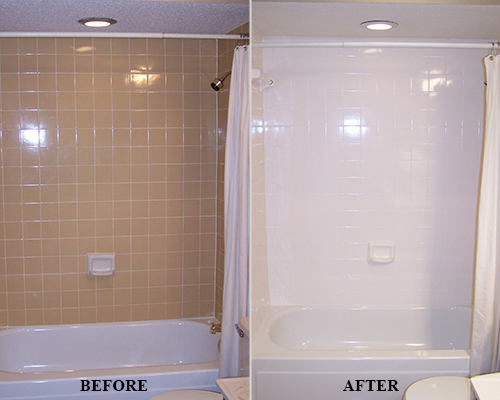 Our bathtub refinishers provide repairs on most surfaces as well. From bathtub glazing and window repairs, we do it all. Refinishing is a process that can modernize your bathroom or kitchen at a fraction of the cost to replace. 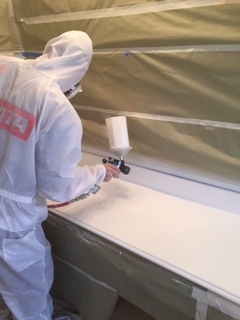 Contact us today for our fiberglass tub refinishing and repair pricing. By refinishing your existing tubs, tile, laminate or cultured marble vanities, you not only save money, but the headache that comes with replacement! We are able to match most colors and can change a dull, dated bathroom to something more modern and exciting. Our process combines quality refinishing material with well-trained craftsmen. ALL SURFACE REFINISHING is the most practical choice for anyone who is looking for REASONABLE remodeling. We can refinish fiberglass tubs, showers and shower pans with the same material as most other tubs. Fiberglass tends to wear and can become weak on the bottom. We can check the bottom and fill in with material to strengthen it before refinishing. Our technicians are able to repair anything from a dime -size chip to a severely cracked and weaken bottom. 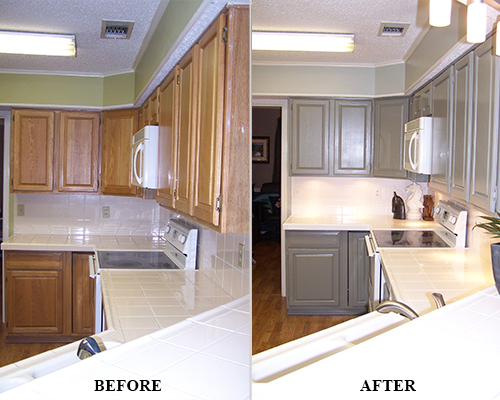 ALL SURFACE REFINISHING can refinish all types of kitchen countertops with either one color or multicolor. Changing the color of the countertop or tile backsplash can transform a dull, dated kitchen to something that looks modern with a fraction of the cost of replacement. Most countertops and backsplashes can be refinished in 1 day. Wood kitchen cabinets that were stained can become dated and can be refinished in any color to give them the look of new factory finished cabinets. We can prep the area and spray the same durable refinishing material used on bath tubs to give the cabinets an easy to clean and durable surface. Kitchen cabinet jobs normally takes 4 to 5 days. Older cultured marble tubs and vanities become dated over time and with the introduction of new tubs and vanities, it can make your older cultured marble look dated and maybe hard to sell. You can make yours look new by refinishing. We are one of the only companies that have over 20 years of experience in refinishing cultured marble. Replacing cultured marble tubs and vanities can also be very expensive. We can refinish for a small fraction of replacement and they will look as good as new. We try to make the process easy. To prepare for our arrival, just have everything off the tub, countertop, and vanities. We will take it from there and prep and protect all surrounding areas. We use an exhaust system to remove as much dust and odor as possible. Please allow a MINIMUM of 24 hours for the surface to fully dry and cure. Due to the nature of refinishing, you may notice a small amount of dry spray or rough feeling on the surface. This is normal and should go away with a few days of use and normal cleaning. If not, just call us and we will come back to polish the area. We have a list of recommended cleaners to use and a list of items not to use on the surface.